The sounds of Handel’s “Messiah” will once again fill Presser Hall Auditorium this Easter Sunday in Lindsborg and be broadcast over the air on NewsRadio 1150 KSAL. Since 1882 the Bethany Oratorio Society has performed the bold piece that traces the life of Jesus, his crucifixion and resurrection in three acts. The musical tradition gives college students and area residents a chance to perform together on stage after ten weeks of rehearsals. “Messiah was written for a performance. It wasn’t written for a service,” Lucas said. Bethany College’s Messiah Festival of the Arts began last week with concerts, art exhibits and recitals and will culminate this weekend with a performance of Bach’s “Passion According to St. Matthew” on Friday night at 7:30pm in Presser Hall. Sunday’s Easter performance of Handel’s “Messiah” begins at 3pm inside Presser Hall Auditorium and will be carried live on NewsRadio 1150 KSAL. 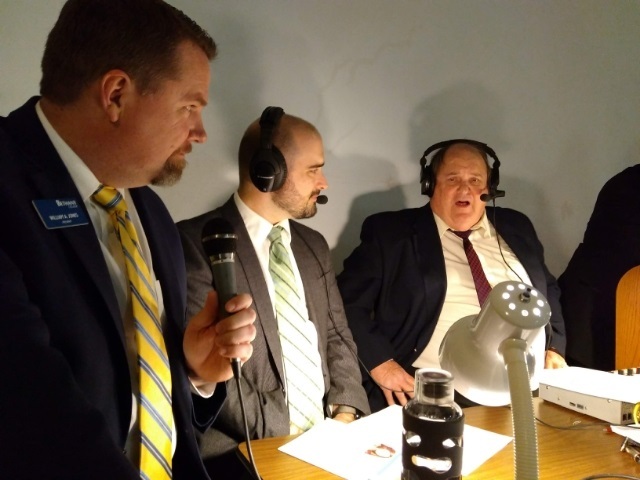 KSAL’s Clarke Sanders (far right) talks with Bethany College President Will Jones (left) during the broadcast from Presser Hall Auditorium in 2018.